I have been thinking for sometime that I would like to write a series of posts about what inspires me. As this is my first entry or chapter if you will, I decided to choose a painting which I first saw when I was 16 or 17 – it completely bowled me over and its effortless beauty has never left me. I first saw “Brown Eyes” on the first sixth-form art trip to the big galleries in London. The tone of the trip was completely different to any other, it felt freer as we were all genuinely excited to be on the excursion. Plus our art teacher was amazing – thank you Mr Rich – should he ever stumble by! If truth be told, I don’t remember all of the trip – it was a decade ago! But I do remember being completely allured by the fresh inviting colours and the softness created by the subtle evocative brush strokes. I was like a moth to a expensive woolly jumper. I stood in front of the canvas for several minutes. 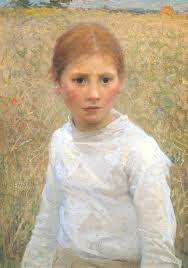 I remember deliberating how he (Sir George Clausen) managed to create such wondrous orbs, how did he capture the soul? I don’t think you can really get how striking this image is online or print, you need to see it in the flesh. On a gallery visit in 2011, I was heartbroken to find the painting was in storage. Before writing this piece, I was curious to see if the painting was still tucked away, but by the powers of the web – and the Tate’s savy site, I was delighted to discover it is rightfully back in full view. What is great art? I think its personal to each and everyone of us. But for me, and “Brown Eyes” is a perfect example, the piece should move you and ultimately leave an impression with you for life. The Game ChangerAm I too late…?